BEACHWOOD – Early in the morning of September 8th, 2001, now-retired Beachwood Borough Clerk Elizabeth “Bette” Mastropasqua stood at the balcony of her stateroom on the Carnival cruise ship Triumph as it returned home through New York Harbor following a trip to Nova Scotia. An admitted shutterbug, she held her digital camera up and was shooting away, as she had throughout the trip and on all previous excursions through the famed waterway near her childhood home of Jersey City. That morning, the Triumph allowed her a wide view of what was shaping into a sunny, mostly clear Saturday over lower Manhattan. She took a couple hundred pictures then put the camera away. Monday would be a busy return to the work and routine of running this borough, population around 10,000. Then Tuesday happened and the word “routine” instantly seemed an alien concept. That morning, Mrs. Mastropasqua was working in her office at 1600 Pinewald Road as a small television set played in the background. While discussing borough matters with a coworker, she was distracted by the device and turned just in time to see a newscaster report that a plane, believed small, had struck one of the towers of the World Trade Center in lower Manhattan. In fact, American Airlines Flight 11, a Boeing 767 stocked with 76,400 pounds of fuel for its transcontinental run to Los Angeles from Logan International Airport, Boston had purposely been flown into the north tower of the trade center, killing all 76 passengers, 11 crew and 5 hijackers on board along with untold hundreds between the 93rd and 99th floors of the 28-year-old skyscraper. It was 8:46 am. Seventeen minutes later, another Los Angeles-bound Boeing 767, United Airlines Flight 175, struck the south tower between its 77th and 85th floors, immediately confirming the incidents as terrorism. Reports of another passenger jet hijacking and strike at the Pentagon in Washington, D.C., a plane crash in Shanksville, Pennsylvania likely related to the previous incidents and speculation that still more were headed to various national landmarks began flowing in over local, regional and national news networks. “The whole day was just a total disaster,” recalled the Beachwood administrator. It wasn’t until Thursday that Mrs. Mastropasqua remembered her trip before the attacks, and the photographs. Among them, one stood out from the rest. In it, the lower Manhattan skyline is just waking to the late summer weekend, and most details of its southwestern facades are hidden in shade. 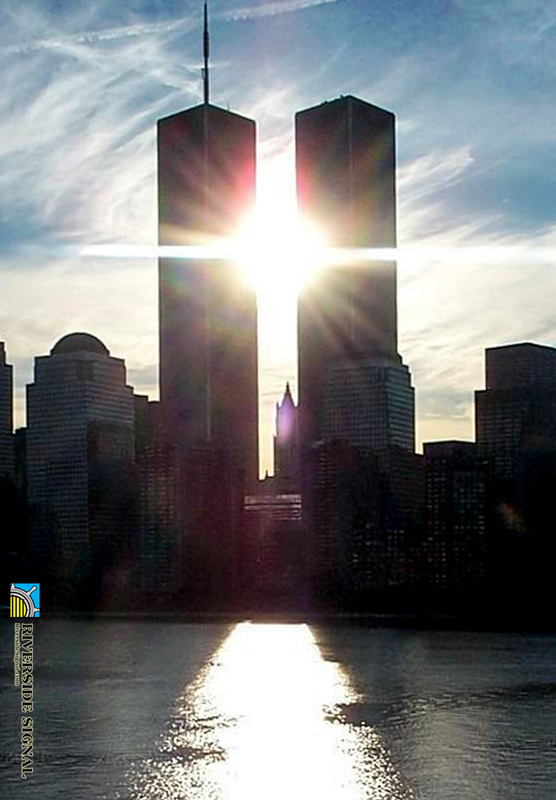 To the right are the two towers, eulogized days later but here still standing tall. There, something peculiar: the sun, rising about two-thirds up their height, bursts forth against a white cloud background, forming the Phoenix-like image of a fiery cross horizontally guarding the towers and shimmering down on the surface of the water. The symbol, she said, gave her a special meaning, having been raised in a devout Catholic household by her father and former Seminarian, Edward Lamp, and mother, Annette, an immigrant from northern Italy. 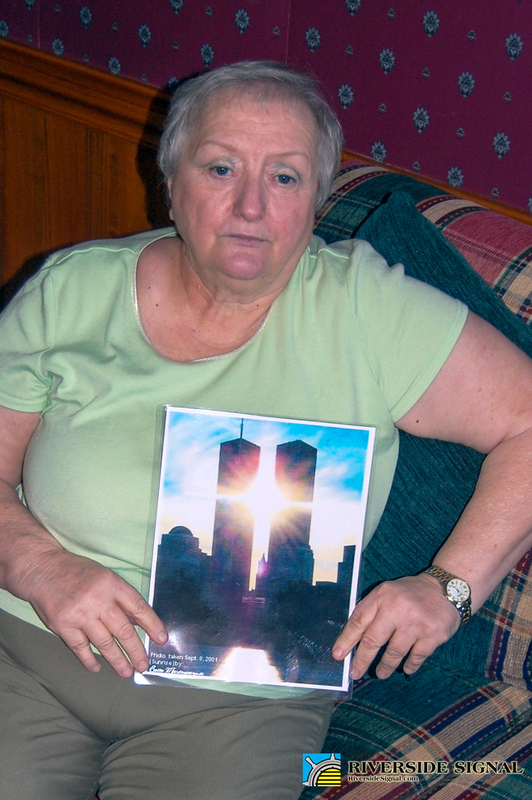 Immediately she began sending a cropped version of the photograph centered on the World Trade Center to everyone she knew, and in the years that followed continued the practice as a reminder to pause and reflect upon the lives and families of those who died in the attacks. The photograph is fast becoming widespread among residents in the New York area and beyond, often shared as a popular social networking profile picture in the days leading up to each anniversary of the attacks. Her father passed away nearly two decades before the 2001 terrorist attacks, but she said her mother, who lives in Florida, responded to them in such a way that it reminded her of the love for country they both had instilled in her as a child. “That was exactly the way my mother and father brought us up. You can do without if somebody needs something, and my mother is what I would hope everybody strives to be as an American, whether they’re born here or not,” Mrs. Mastropasqua added. Reflecting upon such actions in the years that followed, the borough clerk began reminding Beachwood residents to remember the day through notices in the municipal calendar and a memorial service on the first and tenth anniversaries. Looking to the future, she was hopeful that the day would become an educational tool for future generations as a result.